HappyFox Chat plans included unlimited chats, canned responses, integration with Slack, Wordpress, Google Analytics, Shopify, Pipedrive and HappyFox Help Desk. Plans start at 14.99/mo/agent. HappyFox Chat is slightly over-priced for its availability. Once we spoke to a very kind sales-man from them, we were pleased with the integration of dozens of APIs with other platforms. The interface is certainly appealing. HappyFox chat lacks certain features such as keeping both support members when transfering a chat until one takes over. We also found a slight issue with scheduling more than 1 language on the interface. HappyFox Chat's paid plans start at $14.99/mo/agent. How does HappyFox Chat compare with other Customer Service & Support apps? Well, it's fairly easy to use and fairly affordable compared to competition. Many people doesn't know about the software therefore needs more marketing. Need to add more features and updating. New chat designs needed to be added. HappyFox Chat's canned responses allow agents to type less and respond to customers faster. Notifications via native applications for Mac, Windows & Mobile enable communication with customers on the go. 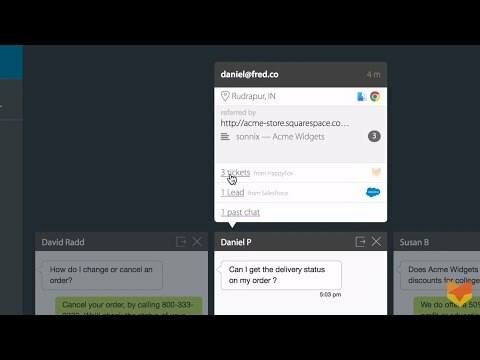 Provide real time support to your customers with unlimited chats. View customer waiting times, average response times, chat duration and more with HappyFox Chat's chat statistics. Below are some frequently asked questions for HappyFox Chat. Q. What type of pricing plans does HappyFox Chat offer? Q. Who are the typical users of HappyFox Chat? Q. What languages does HappyFox Chat support? Q. Does HappyFox Chat support mobile devices? Q. Does HappyFox Chat offer an API? Yes, HappyFox Chat has an API available for use. Q. What other apps does HappyFox Chat integrate with? Q. What level of support does HappyFox Chat offer? Q. Which apps is HappyFox Chat compared to most often?